The weekly 12 flavours of vegan ice cream at the Kind Kones branch in Bangsar Village. Kind Kones is the first fully-fledged vegan dessert bar in Malaysia. KUALA LUMPUR: Most businesses are born out of passion. But Kind Kones is one born out of compassion and the desire to create a healthy form of ice cream, especially for kids. Ishpal Bajaj, one half of the Thai-Singaporean couple behind Kind Kones, the country’s very first vegan ice-cream and dessert bar, told FMT he started the business with his wife Serina, 17 months ago so their infant daughter could enjoy ice cream. 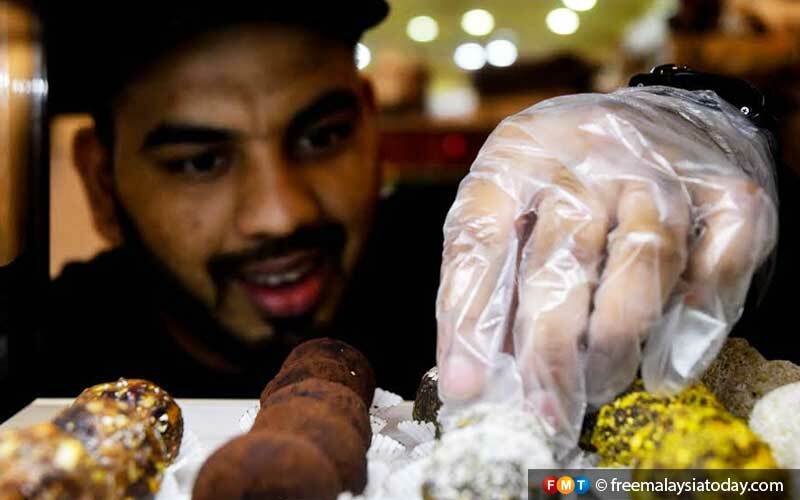 “Kids love ice cream but it contains a lot of white sugar, artificial colouring and flavouring,” Ishpal said, explaining how Kind Kones was different because it omitted these three harmful components. 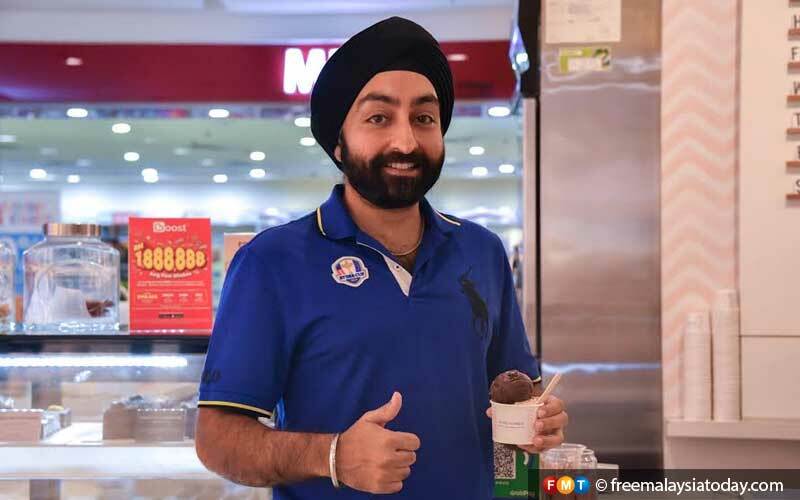 Kind Kones co-founder Ishpal Bajaj says his ice creams are priced about the same as other premium ice cream brands. Not surprisingly Ishpal and Serina, both 35, are vegetarians. Their business promotes veganism, which, like vegetarianism, omits meat as well as animal-derived products like dairy and eggs, the very essentials that go into making the custard-base of all ice creams. The couple do not feed their daughter dairy in any form as they are unsure of how the milk is derived, an argument at the centre of veganism and the main reason why animal by-products are shunned by vegans. Veganism has become increasingly popular in many parts of the world, in light of the needless suffering of animals perpetuated by conventional forms of factory farming. Vegetarianism on the other hand, is a central part of Buddhism and some Hindu traditions, making vegetarian food a common enough find in Malaysia. Despite being dairy-free, the ice creams at Kind Kones are rich and tasty, deriving its full nutty flavours from coconut oil as well as coconut-, almond- and cashew-based milks, or a combination of all four. There is no refined sugar used, or preservatives and additives in any of its 120 or more mind-numbingly delicious flavours. The downside? Kind Kones’s ice creams have a shorter shelf-life. The upside? Ishpal’s chefs get to whip-up fresh batches of ice cream more frequently depending on which flavours top the list of favourites. “It gave us the idea of finding out which flavours customers prefer. So, we do social media runs and ask them what they like,” he said, citing the Cinnamon Gingerbread flavour they created over Christmas that got the thumbs-up all around. Serina heads the research and development that goes into concocting one fabulous flavour after another, and used the Bajaj home kitchen to work her magic when the business first started. However, following Kind Kones’s whirlwind success, experimentation was moved to the kitchen of their Plaza Damansara outlet instead. Chocolate Fudge ice cream in a cup. 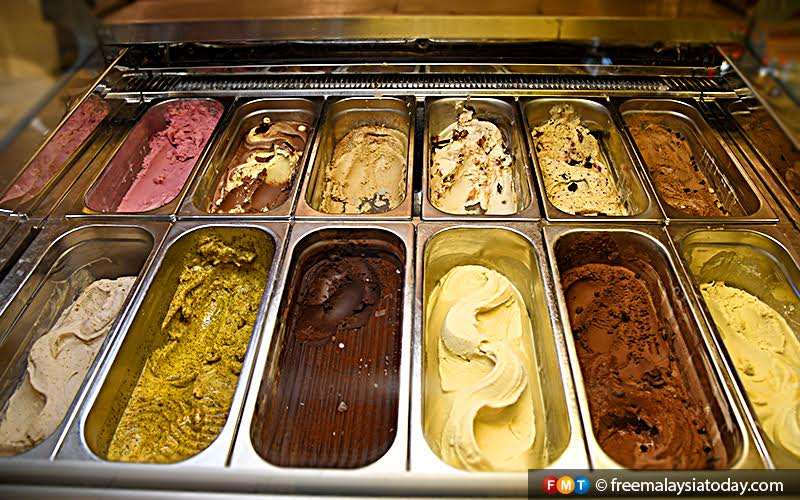 One scoop costs RM9.90 while some premium flavours are RM1.90 extra, excluding toppings. Vegan cones are also available. Besides ice cream, eager customers can expect desserts of every kind imaginable at Kind Kones – vegan cakes, “bliss” balls, bagels with vegan whipped cream, pancakes, waffles, breads and cold brew coffees with nut-based “milks”. 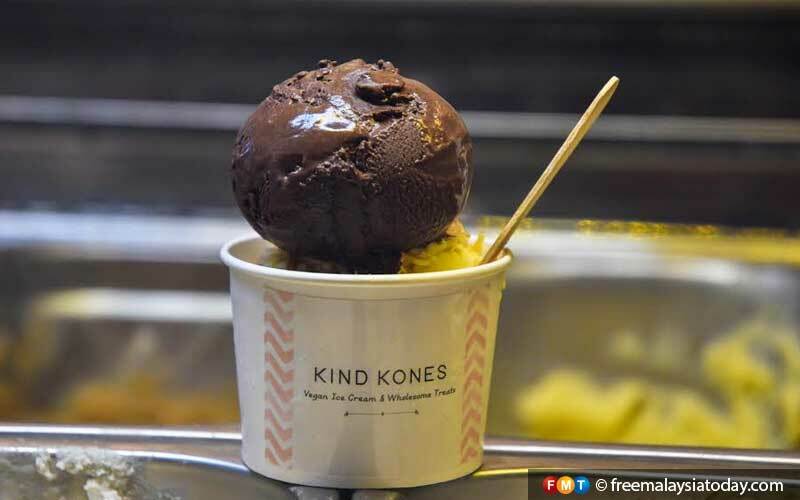 Every week, Kind Kones switches up its regular ice cream flavours such as Salted Chocolate Chip, Dark Chocolate and Lemon Lime Sorbet. Ice cream is priced at RM9.90 per scoop with “premium” flavours costing RM1.90 extra. Pricey? Not so, says Ishpal, citing similar prices at other mainstream ice cream parlours. Truth be told, the price is justifiable given the high-quality of the ingredients used. Cashews and almonds are not grown locally as is vanilla or passionfruit. Despite the price, Kind Kones sees regular bookings for catering at weddings and birthday parties. So popular has the name become that there has been a 300% increase in customers since 2017. There are currently five Kind Kones outlets across the Klang Valley with its latest in Empire Shopping Gallery, Subang Jaya. Ishpal says he also plans to open an outlet in Singapore next year. But this dynamic couple weren’t always so sure about venturing into a wholly vegan business. Ishpal said the biggest risk was segregating the market by branding themselves as vegan-only. A Kind Kones employee arranging the ‘bliss balls’. Apart from vegan ice cream, there’s also vegan cakes, bagels, pancakes and waffles. Ishpal said the hardest part of the business however, has been persuading people to give the ice cream a try. He hopes the stereotype that vegan foodstuff is tasteless will someday be a thing of the past. In a show of bravado, Ishpal says he hopes to someday take the business to the rural parts of the country, but that for now, Kind Kones will stay put in busy city centres. This is not the first food business the Bajaj family has ventured into. They run Raisin’ the Roof, a restaurant in Damansara Heights that promotes healthy eating and vegetarianism. It is also here that the couple sell their trademark raw vegan desserts. It’s not all about the dollars and cents for this couple – Kind Kones gives back to society as well. A past collaboration with prominent Malaysian women to create new ice cream flavours, saw proceeds channelled to charitable organisations. As part of the campaign, a group of children also got to enjoy free ice cream. Kind Kones’s five branches are located at 1 Mont Kiara, Bangsar Village, Empire Shopping Gallery, Plaza Damansara and Mid Valley Megamall. Orders can also be placed online for its vegan cakes and breads.